Cyril Despres is back! After the French former Dakar-winner in the Motorbikes and Peugeot-factory driver finished the Peugeot-engagement, he is back on four wheels in the Abu Dhabi Desert Challenge. In Abu Dhabi he is driving with a French SMG-Buggy with V8-engine, operated by the Team 2WD Two Wheels Drive of Eric Mozas. 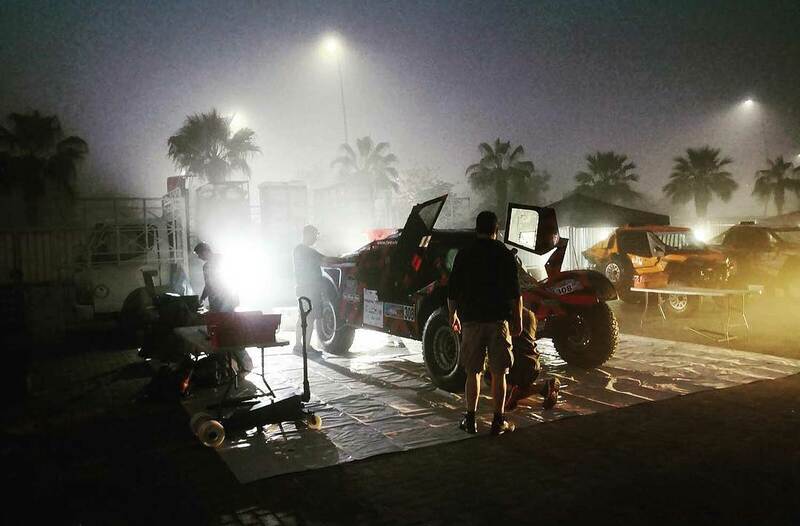 "The Desert Challenge is a rally I've won five times on bike but I’ll be back on 4 wheels," said Cyril Despres. "Thanks to Two Wheels Drive’s team boss Eric Mozas and the opportunity to pool our experience on this race, I’ll be driving the 2WD buggy, co-driven by my friend and talented Swiss skipper Stève Ravussin." But how did he got this opportunity? "I received an interesting proposal to race this buggy in Abu Dhabi from Two Wheels Drive," Despres stated. "The buggy itself is a strong and powerful machine with an experienced, small team of six people that have been working on it. I’ve never driven on four wheels in the deserts of Abu Dhabi before so I’m looking forward to that. I think me and my friend Steve Ravussin are going to have some fun in this fuel-injection buggy. Steve is a skipper on a boat normally so this is good chance for us to discover the desert together. There’s some fast guys at this race and I’m aiming to be battling at the front with them." The race started with the Prologue on the Formula 1 circuit in Abu Dhabi. "The delivery of the buggy got delayed so we only had a very short roll-out Saturday morning before we tackled the 1.9 km super stage on the Yas Marina circuit," said Despres. "After the first 1 km long straight, I came pretty fast in the first left corner and didn’t anticipate the power of the buggy which I couldn’t test a lot yet. It started to spin out and when I realized I couldn’t stop it, I let it slide so we did a nice 360 to get back to the right track. It was fun but I am not an asphalt-driver," he reported. The first stage on Sunday about 276 kilometers was running well for the Frenchman, in their SMG-premiere Despres and Ravussin finished 7th with 03:26:43 hours, only 12:13 minutes behind the stagewinner Jakub Przygonski in his X-raid Mini. "We had a lot of fun! Steve has done a great job for his debut in rallying and I need to make a few more adjustments on the buggy. We enjoy it a lot," Despres said after the stage. 01) Jakub Przygonski / Tom Colsoul (POL/BEL) I X-raid Mini I 03:14:30. 02) Luc Alphand / Andreas Schultz (FRA/DEU) I X-raid Mini Buggy I 03:15:10. 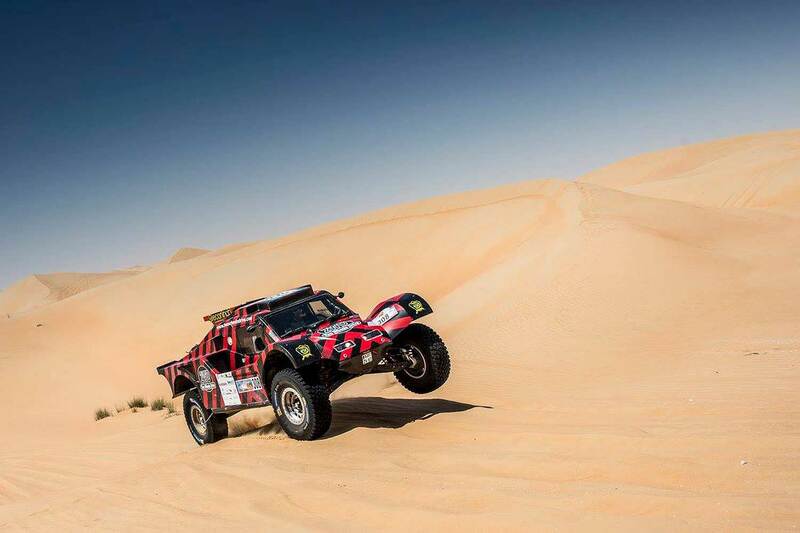 03) Yasir Seaidan / Aleksei Kuzmich (KSA/RUS) I Toyota Hilux Overdrive I 03:16:18. 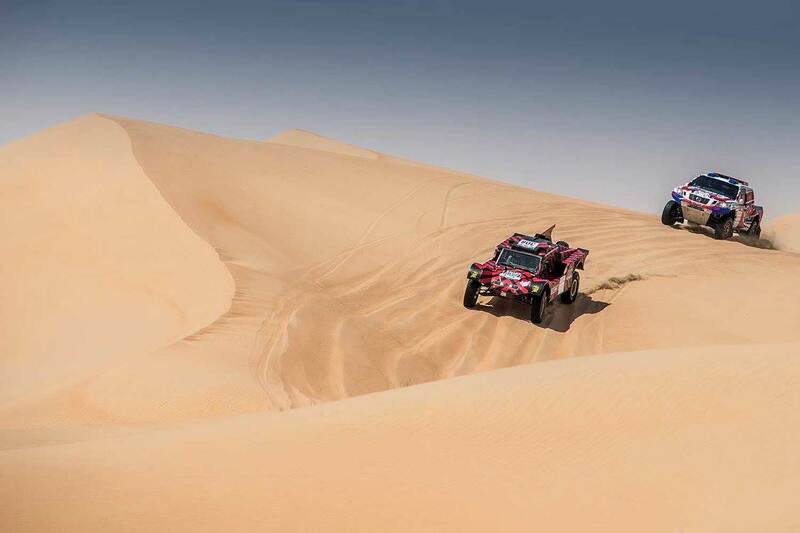 04) Khalid Al Qassimi / Xavier Panseri (ARE/FRA) I Peugeot 3008 DKR I 03:21:58. 05) Martin Prokop / Jan Tomanek (CZE/CZE) I Ford F-150 Evo I 03:23:51. 06) Vladimir Vasilyev / Konstantin Zhiltsov (RUS/RUS) I X-raid Mini I 03:24:09. 07) Cyril Despres / Steve Ravussin (FRA/CHE) I SMG 2Wheels Buggy I 03:26:43. 08) Harry Hunt / Sebastien Delauney (GBR/FRA) I Peugeot 2008 DKR I 03:30:28. 09) Yazeed Al-Rajhi / Timo Gottschalk (KSA/DEU) I X-raid Mini I 0:31:08.